Let us begin with some history. 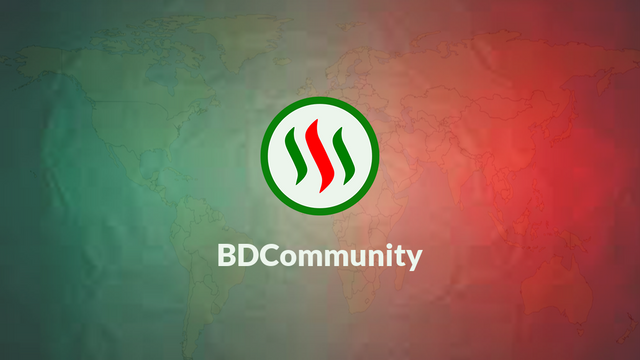 We started BDCommunity five months ago with a view to helping Bangladeshi content creators and branded it as STEEM.com.bd. After a few months, we paused its operation because of core members leaving the blockchain or became inactive. We are resuming operation with a new introduction. When we envisioned BDCommunity, Steem was a tough place for Bangladeshi people. English is not our first language. We did not know the rules, norms, and etiquettes of the Blockchain. Many turned to spam, low quality plagiarized contents and bid-bot abuse for rewards. We are trying to establish BDCommunity as a platform where every individual can ask questions, get support and encouragement, and receive rewards for quality contents. Our main focus will be Bangladeshi content curation but we are committed to supporting other creators too especially newbies. We are running a score based curation initiative which is voting on manually curated contents when our voting mana is at a certain percentage. Our BDExchange bot enables a peer-to-peer exchange of STEEM/SBD for fiat. It also converts STEEM to SBD or vice-versa at the best price from Steemit Market. This is helping non-technical and new users a lot. On our Discord server we have contest runner bot that enables an individual to run and manage a contest easily and increase engagement. @zaku and @bdvoter are donating discounted account creation tokens so that we can create new accounts to onboard new users. We are actively reporting abuse in the Bengali language to @steemcleaners. The management team currently includes @reazuliqbal as a developer, @zaku, and @sourovafrin as moderator, @linco, and @ayasha as curator, @mhossain, @sheikhsayem, and @zayedsakib as scout. Our curation initiatives are dependent upon delegations from the community. Here is a list of our current delegators. Hopefully, our community programs will make a significant contribution to the Blockchain! We believe in the power of community. Hope all of you will cooperate with us. Thanks for your words. I stopped by because @sherbanu has featured you in her entry post to the pay it forward contest this week. Always good to see more projects geared toward helping the small accounts grow. Good to see @bdcommunity is back in action! I think there is no turning back now. Wish you all the best! BDcommunity has slowly been growing, as we grow, we think of new ways of interacting and helping each other. In this path, we need all of your cooperation in the future. Thanks. Hopefully, the community will be a lot better. It is very useful for Bangladeshi and will go a long way. We believe an organized and effective communication within the community can determine the success. Thanks for your appreciation. Absolutely right. Communication can always reach the desired goal through support and labor of all. Long live @bdcommunity. This is a great community project. This is really nice to have support in the beginning. Hopefully, we all together will improve the Steemit society. @bdcommunity I have to say it's a great idea and it will pay off in the end. I've seen time and time again, you give someone the means to learn the platform and teach them what to do when it comes to comments and voting they soar. I wish you the best in growing the community. As you know @sherbanu featured you in Week 27's @pifc's Pay It Forward Curation Contest. Thank You for your valuable words! Hopefully, we will all make a good change. Community can make a society clean and better for the upcoming next generation. 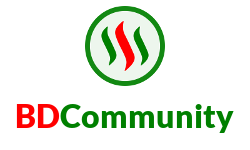 Here community can help steemit society. Go ahead. best of luck. We dedicate ourselves to improving the steemit society around us. Our team is the foundation of our success and growth! Thank you for your support! Very useful to have steem community for India people, mostly they need guidance for bringing up more quality content, you have my support... Good luck and wish you a successful journey! Yes! We will exhibit how to make a quality content and going to address important complexion regarding the overall quality of a post that goes beyond any informative content. We must thank you for your support at this time. Hope @bdcommunity will be a big and successful community in Bangladesh. Keep moving. A community is not a one or two man show. We also need you to help us to help everyone. Thank you very much. The community is a sign that always advances in helping each other, where there will be no selfishness. BDCommunity will look after each other and support all Steemians who do not get enough attention that they deserve. We must thank you for your support at this time. Thank you @priyanarc and we are very glad that you have joined the team! Hopefully BDCOmmunity will grow more smoothly. We appreciate our supporters. Hopefully, we all together will improve the Steemit society. Thank You. I may know the answer. But very important I recommend you to never give up any off your passwords they are yours ! Please for safety tips read and visit the white paper. Or visit @arcange for information. To easy post use Partiko and to control your account use Steemify. Thank you for your suggestion and additions to our community. This is exactly the kind of input we need to better serve members needs. BDCommunity is committed to helping each other. The ideas and suggestions of innovative, thinking people are always welcome. We hope to see you on our channel. Great initiative you have there! This kind of project is one of the most needed initiatives here on Steemit to encourage others. May your account grow more so you are able to help more people. I came across your article through @sherbanu who featured it on his post which is an entry for Pay It Forward Curation Contest. The contest is open to everyone so you are welcome to join. We try to support all Steemians who do not get enough attention that they deserve. We inspire them for putting their effort to make quality content. Thanks for your good wishes. Yes, I know what you mean. That is basically the same purpose PIFC has. Our main aim to support all Steemians who do not get enough attention that they deserve. We love to share our knowledge and experience with each other. Thank you for your feedback. Join the party on Discord Come by, say hello, ask questions, and have fun! 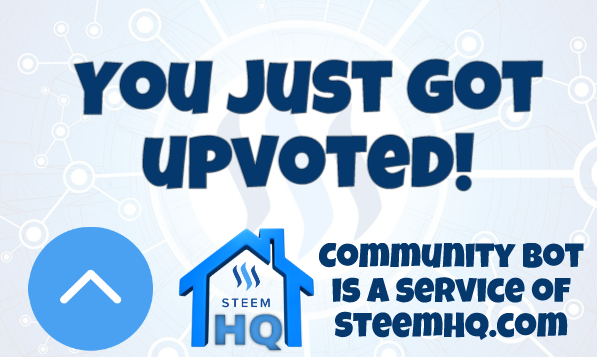 you just received a 14.43% upvote from @steemhq - Community Bot! Wishing you well in your curation efforts.